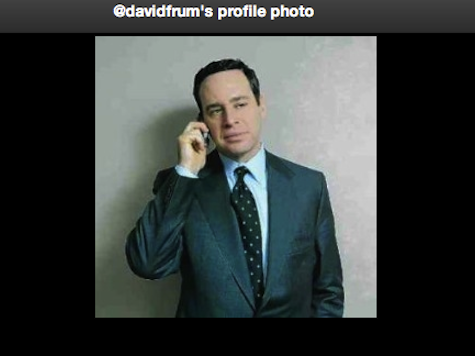 Did You Know That David Frum Has Used a Cell Phone? Yesterday, I hopped over to CNN/Newsweek/Daily Beast staffer David Frum’s twitter feed when I heard that he was spreading the lie that gun rights advocates had heckled the father of a Newtown massacre victim. Of course, that claim was quickly debunked and several high profile media outlets and personalities posted appropriate corrections. But not David Frum, who doubled down. As far as we know, none of the news organizations that employ Frum have a problem with him spreading false information to smear a group of Americans. But that’s neither here nor there. The point of this post is not that David Frum is dishonest and vindictive. It’s that he has, in at least one instance, held a cell phone to his ear while he wears a suit and looks to the left like a cool guy.